Create your own Movie Theatre or Cinema signage with this super value kit from Forum Novelties. 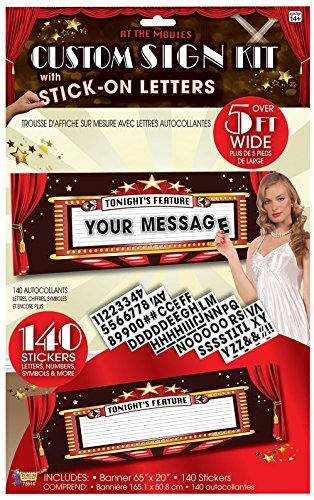 Matching with the other items from the "At the Movies" range, this is a printed banner 65" x 20" which comes complete with 140 character stickers with which you can create your own message which will have the appearance of being 'up there in lights'. Over 5ft in length, the banner has eyelets in each corner allowing to hang this where ever you want. This must be the perfect finishing touch to your awards night celebrations or movie themed costume party.